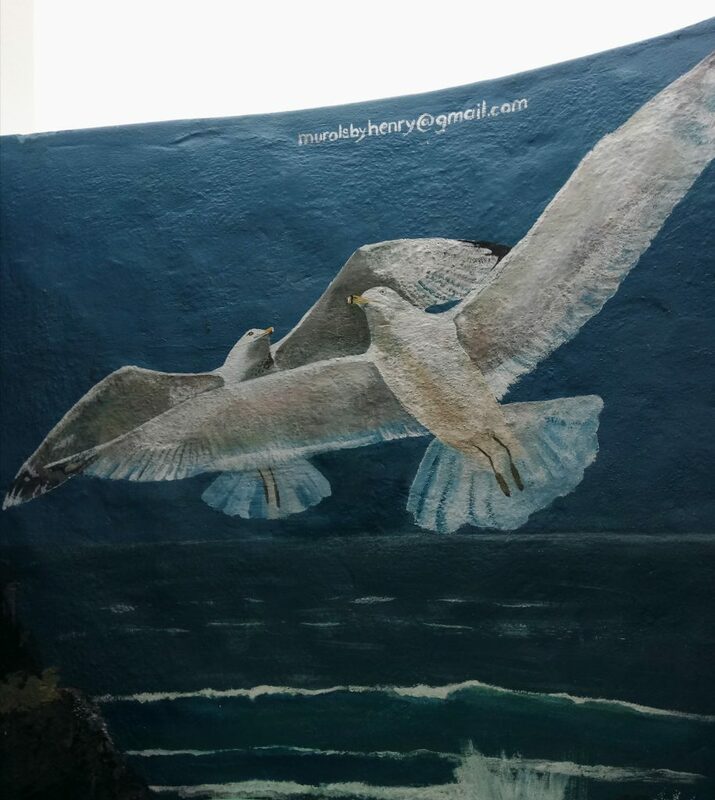 Whenever possible, any time I know I will be going away on a trip, I do thorough research of the area and its best activities and eateries… usually, we don’t get to half the stuff I earmark but, for the ones we do, they always seem to live up to my expectations. I would say the same was true for Hearts 4 Coffee… except it didn’t only live up to my expectations – it surpassed them in the best possible ways. From the moment we stepped into its cosy confines, leaving the wintery weather behind, my first declaration was that this is “a Tamlyn place”… and it certainly was. 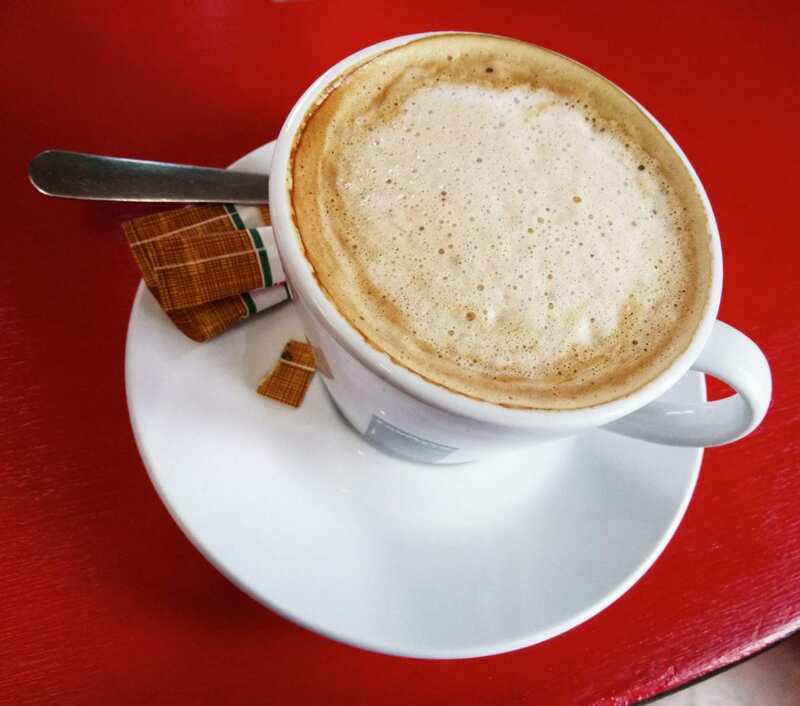 I love places that offer not only excellent, freshly prepared food but that, above all else, impress you with their friendly service and dedicated staff – and that was precisely the case with Hearts 4 Coffee. 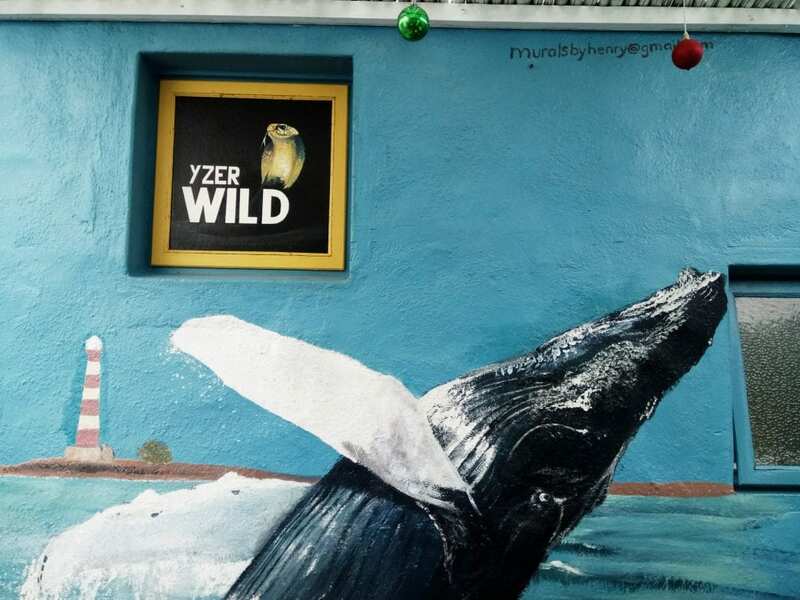 We (and those eating there at the time) were warmly received and carefully looked after from the time we arrived till the moment we regretfully had to bid farewell not just to Yzerfontein, but to Hearts 4 Coffee too. To say Hearts 4 Coffee was the perfect, fitting end to a wonderful weekend is, again, an understatement. Hearts 4 Coffee is not your traditional café or coffee shop and that’s evident from the time you first see it from the outside, standing cheerful and proud, with its white and royal blue colouring and eye-catching whale tail mural, and ignoring the impending gloom of even the greyest skies. 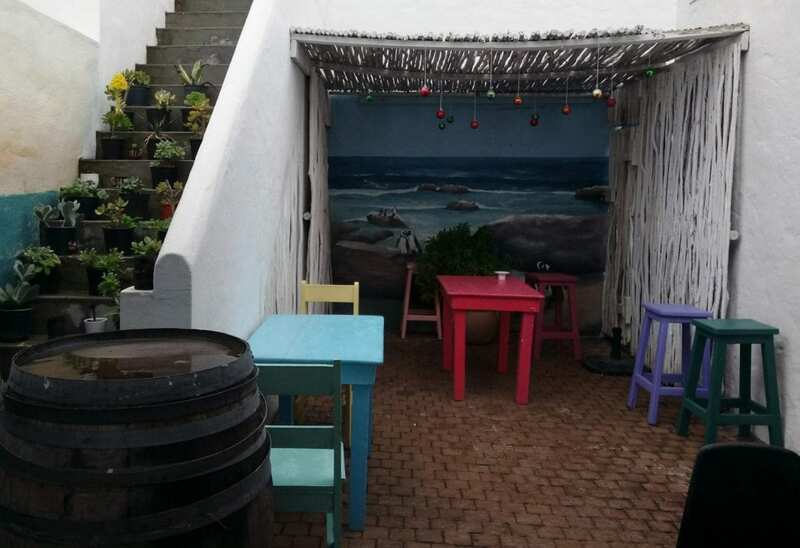 Hearts 4 Coffee not only offers a lovely front porch, dotted with brightly coloured tables and chairs, that overlooks the crashing waves a stone’s throw away, but it also offers lovely seating inside. It’s far from big inside the main café but what it lacks for in size, it makes up for in character and charm. I want to say it is pretty but it’s definitely more quirky and fun than anything else, as a mishmash of hilarious quotes (R95), scarves, magazines, fridge magnets, personalised/quote number plates (R85) and other lovely gifts and purchasable goodies align every inch of its whitewashed walls. There’s an element of playfulness that abounds within but there’s also a real sense of homeliness, of fun, country-style hospitality, in everything from the unique décor and wares to the candyfloss pink stand, which bears a number of special gifts for those you love, like special cups for mum or dad. 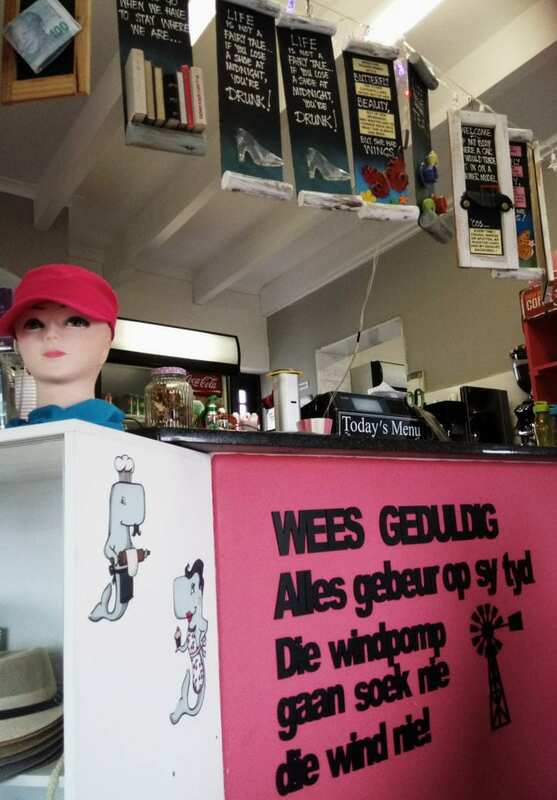 Their bottled jams and preserves also lend to the feeling of good, ol’ fashioned Cape goodies, which are always quintessential parts of cafés and farmstalls in small towns right across the Western Cape (and Yzerfontein is every bit a true, small Cape town)! Other thoughtful touches are found in the small blankets draped invitingly over each chair in case you need a little added warmth while you dine. And although I was initially a bit sad not to be able to sit outside on the porch, the interior seating offers wonderful sea views regardless so you don’t feel like you’re missing out either way! 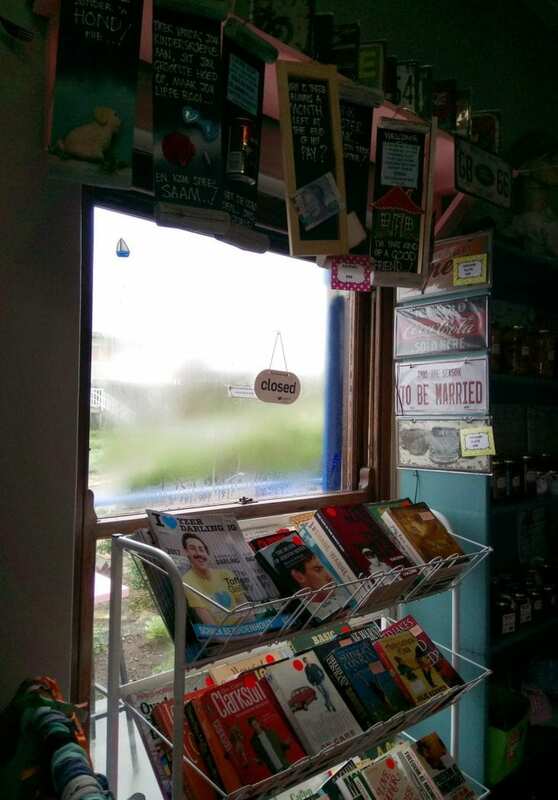 After I had finished exploring this adorable, little space, we could finally place our first order. 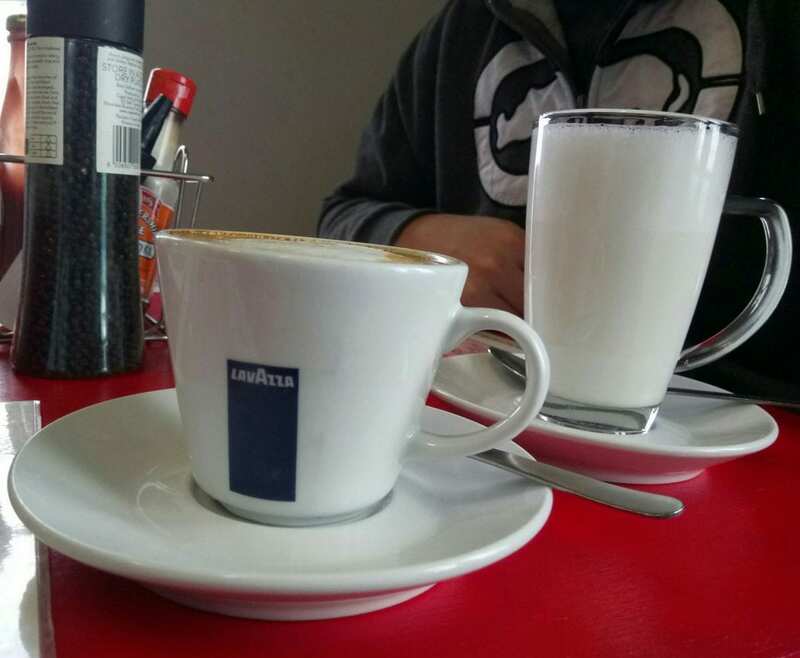 We started off with a cappuccino (R24) and a latte (R23); these were brought to us very quickly and were both lovely. As such, we both rated them 8/10. The menu offers a wonderful choice of breakfasts, lunches, beverages and cakes (there is also a nice kiddies’ menu) and includes: tramazzinis, foot-long cheesy Russian and chips, scone/muffin with preserves, beef or chicken wraps, homemade pies, tower burgers and rolls. There is also a nice assortment of drinks, including different lattes, red cappuccino, specialised teas, white chocolate and of course, their delicious-looking double thick milkshakes too (which offer standard flavours like strawberry, chocolate and lime, as well as Oreo, Nutella, Coffee, Bubblegum and Peanut Butter). Shortly after that, owners Glenda Williams and Nick Binneman arrived and spent some time kindly chatting to us. Taking over what used to be the Whale Tale Studio Café, they have poured their passion, dedication and colour into Hearts 4 Coffee (which opened in 2014), and have lovingly made it entirely their own. Glenda and Nick further explained to us how they also offer catering and even have their own mobile food truck, which they travel to events with – such as the annual Riebeek Cellars’ Valley Olive Festival, ATKV Solms-Delta Oesfees, Country Market at Groote Post (where I recall seeing them in 2015 when my parents and I attended the market) and music performances at Hillcrest Quarry. They have also done catering for the occasional filming crew and wedding but they are keen to do more catering and event coverage going forwards, with a mind for further expansion in the future. Another thing that I saw while perusing their Facebook page is that around Christmas time, they also offer glorious Christmas cakes and gingerbread houses available for order… these look absolutely gorgeous! Also, Hearts 4 Coffee does takeaways so if you ever visit but can’t stay for long, that’s definitely a good alternative to consider! After a good chat, it was time for us to order our main meal and for me, it was a fairly straightforward decision because I love tramazzinis, so I opted for the chicken, pesto, cheese and mayo tramazzini with chips for R65, while my man had a more difficult choice between either a beef or chicken wrap (served with tomato, onion and sweet chilli sauce and chips, or salad). 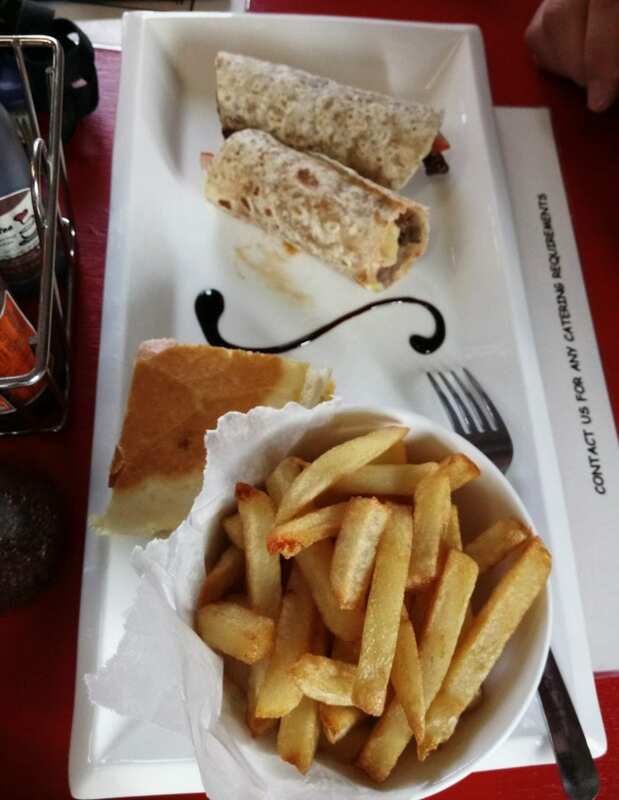 In the end, he opted for the chicken wrap, with a side of chips for R70. Again, our meals were prepared timeously and served with an attractive little swirl of soy sauce. I have never had a 6-piece tram before and passed two pieces onto my man because it was really filling even just with four! Especially when both our meals also came with a well-filled bowl of delicious chips, which I thoroughly enjoyed. I loved my meal and easily awarded my tramazzini a 9/10 rating because, not only was the filling the perfect mix of ingredients, but it was also really fresh and warm. My man gave his chicken wrap an 8/10 rating and also enjoyed his meal. And although I was really full after that, we simply couldn’t leave without trying one of their marvellous cakes of the day. 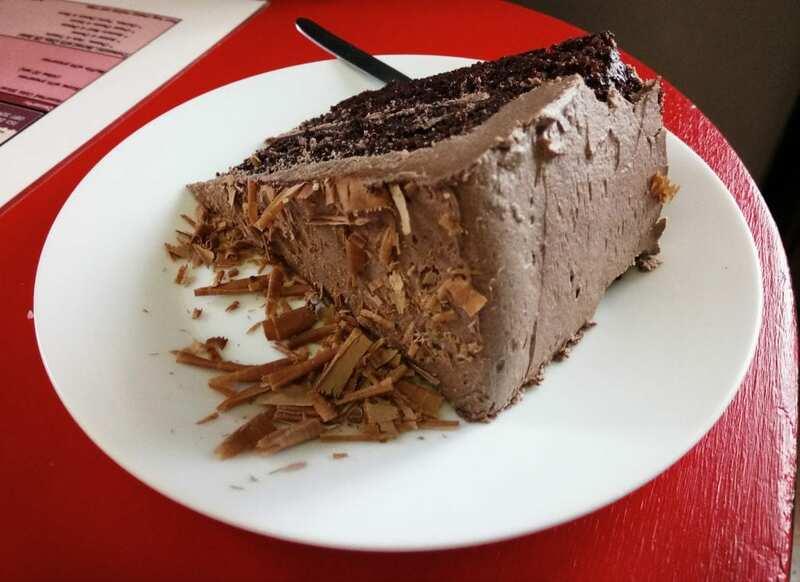 It was a tough decision for me between the chocolate and granadilla cheesecake, which both looked divine, but I was fortunate enough to try a mouthful of both in the end. 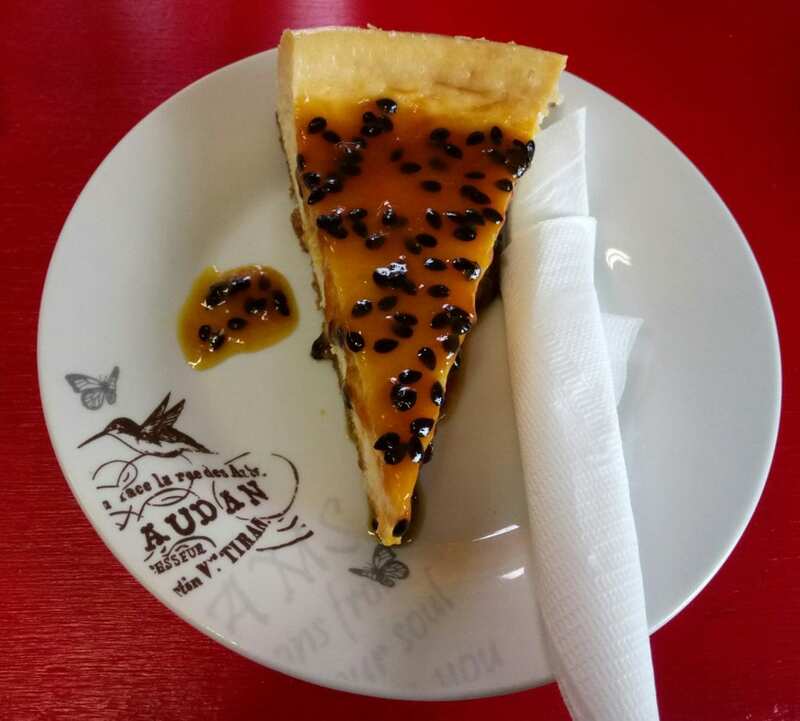 I ordered the granadilla for myself, while my man went for the chocolate… both were seriously fresh, very generously sized and mouth-wateringly good so we easily awarded our cake slices a 9/10 rating. Then, it was time to be on the road again (after quickly buying a lovely VW combi number plate), so after a quick look around the beautiful, partially sheltered courtyard (which is both child- and dog-friendly), tucked away at the back and decorated with stunning murals of Table Mountain and ocean scenes, wine barrels, colourful tables and chairs and a wide assortment of tiny potted succulents, we finally had to leave Yzerfontein and the delightful Hearts 4 Coffee behind and return to the city. For a number of reasons, my overall rating of Hearts 4 Coffee is a firm 9/10, which is something I very rarely award a place because it’s a very high rating indeed in my books – but thanks to excellent service and warmth all round; delicious food with large portions; a nicely assorted menu, a wonderfully charming setting (with different seating options for every occasion); and a charming country atmosphere, it’s something I am very pleased to be able to give to Hearts 4 Coffee. 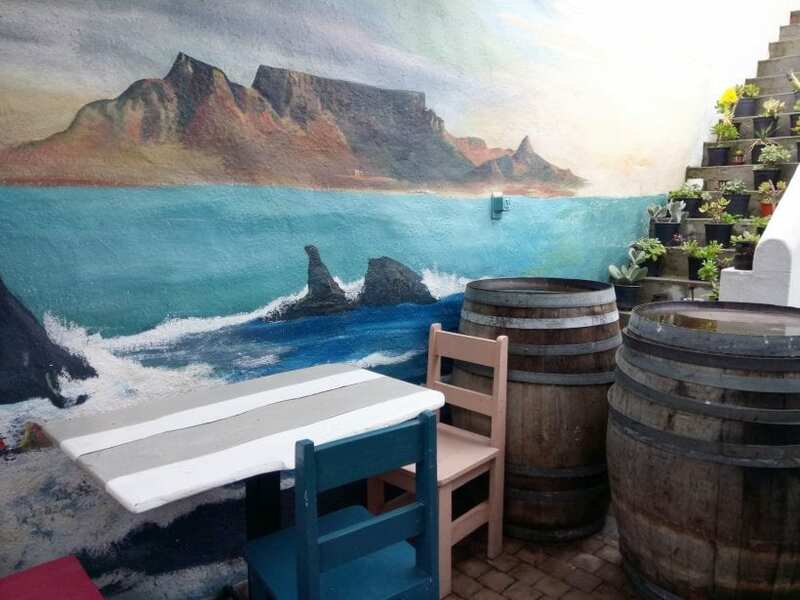 This little spot is big on heart and it will make a wonderful stop, whether you’re after a quick bite to eat, a catch-up with friends or simply a cosy date for two. Thanks very much to owners Glenda Williams and Nick Binneman, and their wonderful small team of staff for our wonderful first experience of Hearts 4 Coffee and for going out of their way not just for us, but to all those inside at the time. 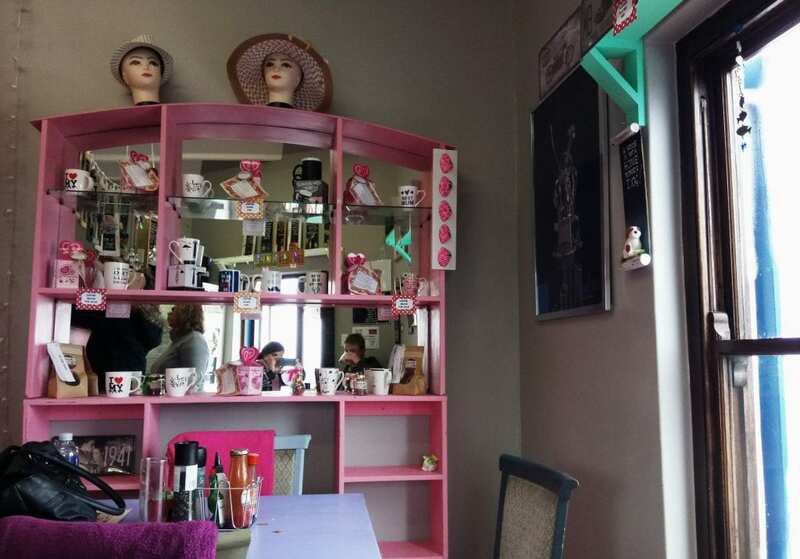 Hearts 4 Coffee is located at 153 Dassen Island Drive, Yzerfontein, and is open Monday to Sunday, from 9:00am – 16:00pm (please note: the kitchen closes at 15:30pm). For more information, you can contact Hearts 4 Coffee on (081) 504 3606 or (071) 120 4994 or email them at hearts4coffee@gmail.com. Additionally, you can like them on Facebook at Hearts 4 Coffee.